The purpose of this document is to provide guidance to USAID missions, other donors, and implementing organizations operating in crisis and conflict-affected environments for the development of project indicators and metrics to measure equity of access to educational opportunities. Although this document uses terminology that is current within the framework of collaboration between USAID missions and their implementing partners (IPs), the overall guidance for indicator development should be broadly relevant and applicable among other agencies, donors and organizations. 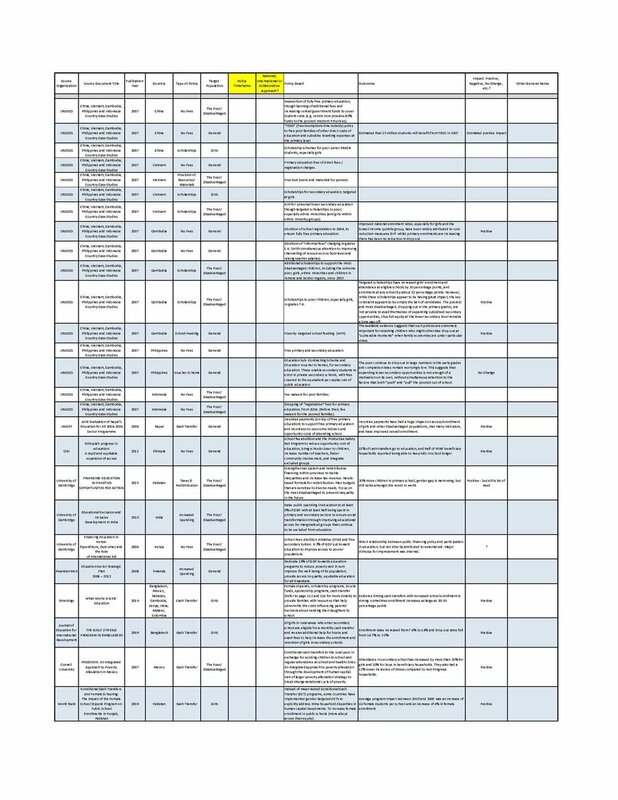 This is an active spreadsheet of the matrix of program interventions in crisis and conflict-affected contexts developed to inform the Education Equity Indicators for Access guidance that constitutes a more detailed and sortable matrix, including references to available studies on the interventions. The matrix indicates which intervention or set of interventions are most suited to targeting and promoting school access and/or retention among the specific population sub-group(s) most likely to include out-of-school children. The matrix can inform project designers’ selection of specific interventions based on the context-specific equity dimensions, barriers, and zones of exclusion that the project has identified. The Measurement and Metrics working group built off their landscape review to produce practical recommendations of best practice standards for measuring key equity dimensions. These recommendations are put forward as a means to consolidate current best practices in data collection in education and to chart a way forward together. They serve as a sounding board for future data collection and analysis as well as a starting point for honing our practice in areas not yet well measured. As these recommendations are integrated, we will make further refinements based on experience and will revisit our progress together annually. Our hope is that through more consistent metrics and analysis we can further both evidence and dialogue in pursuit of educational equity. 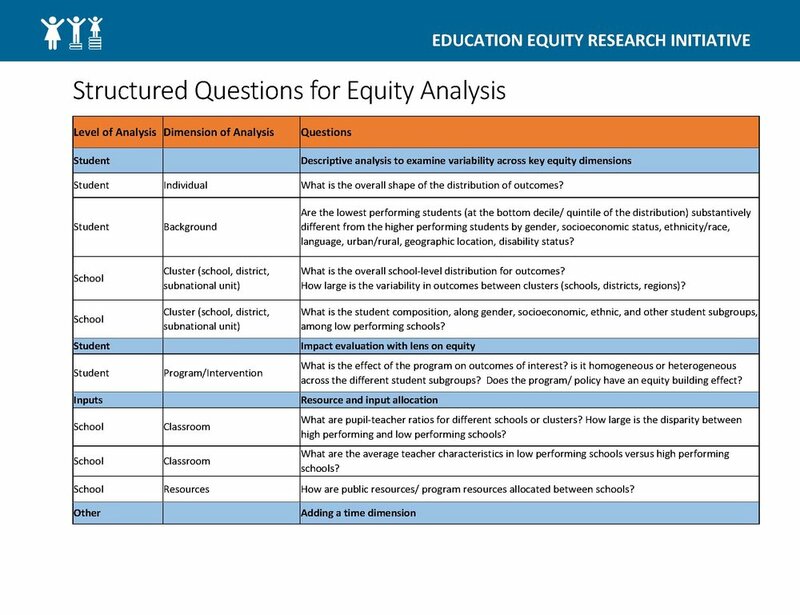 This report presents the findings from a literature review of the current policies and practices for financing equity in education, as part of the Finance and Resource Allocation work stream of the Education Equity Research Initiative. 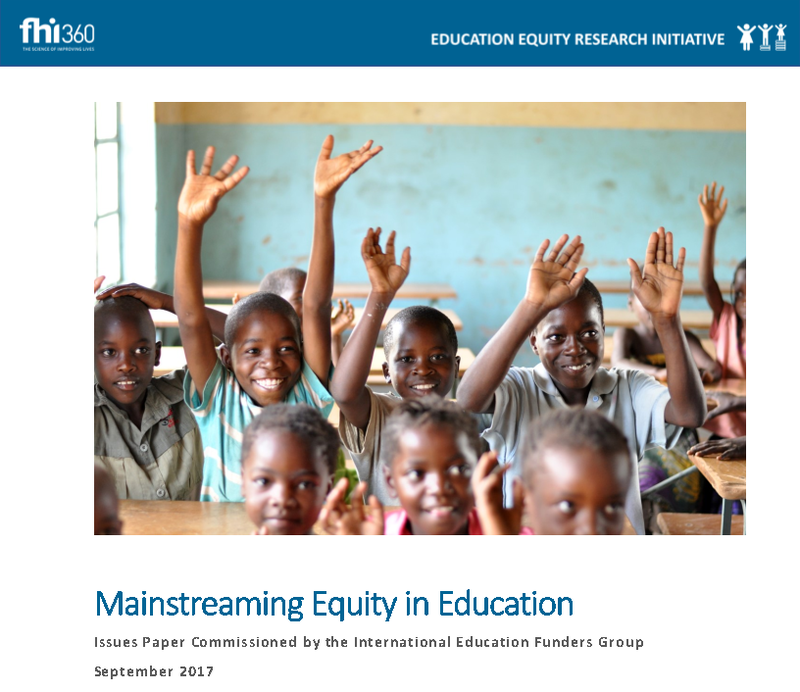 This brief provides an overview of the policy compendium spreadsheet that was developed to inform the The Fair Financing: Education Finance Policy for Equity Literature Review. To inform the literature review, a policy compendium spreadsheet was developed. 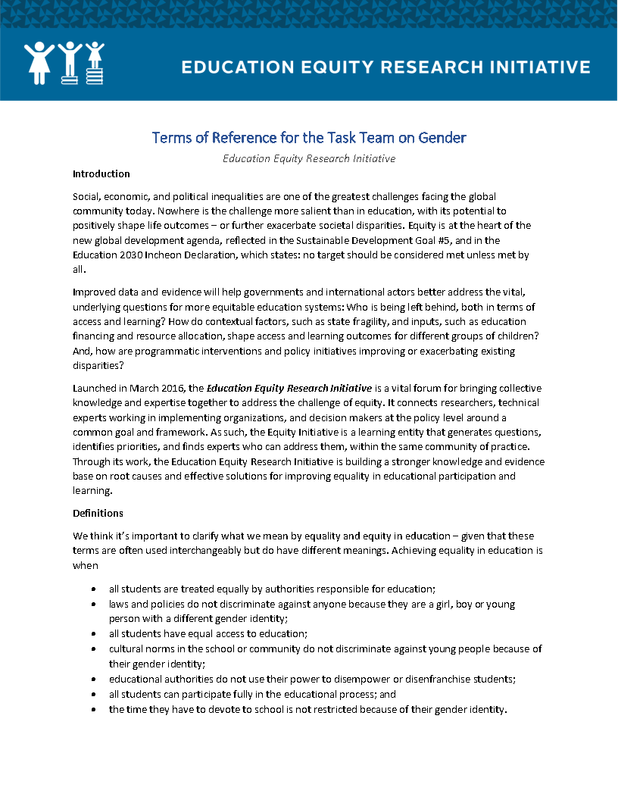 This was done with the aim of collecting and organizing information on specific education finance policies in a simple, user-friendly format in order to better understand what education finance policies exist with intended outcomes of equity, who they are targeting, and what their impacts have been to date. 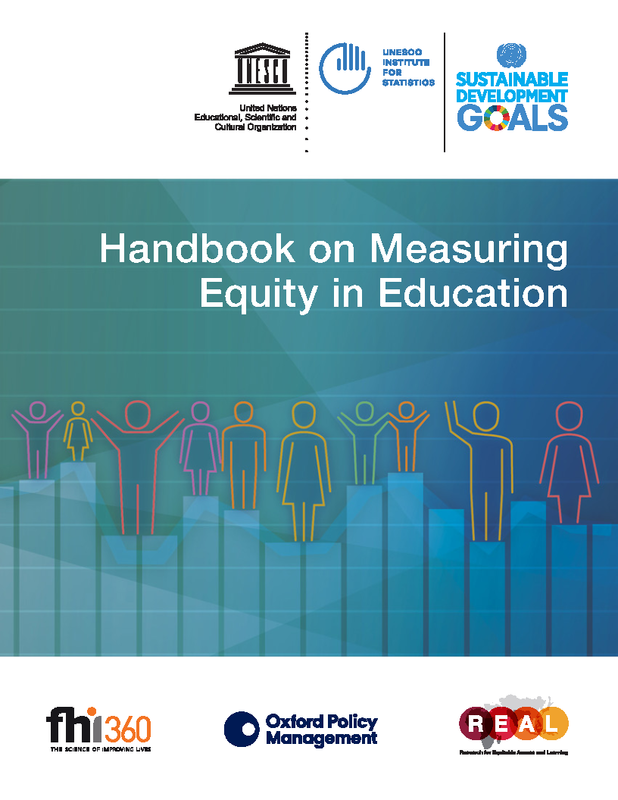 It is hoped that this policy compendium will help to inform the Education Equity Research Initiative’s future research and serve as the start of an evidence base on education finance policy for equity in order to help align resources with the needs of disadvantaged populations.